A database of time and location of avalanches in Făgăraș Mountains was completed, and first avalanche inventory based on GeoEye-1 images was conducted. These data are very useful for an objective evaluation of the location, magnitude and frequency of the snow avalanches in the Carpathians. An automated detection algorithm for snow avalanches in optical images has been developed and validated using HR and VHR satellite images. The texture characteristics of the avalanche-affected snow were extracted by convolving the image with a set of 12 multi-scale multi-directional filters. The algorithm has correctly identified many of the avalanches in the test areas (up to 87% from the total number of avalanches). Detection errors were generated by the variability in terrain and snow characteristics. To compensate these effects, is possible to increase the number of filters. The algorithm has been tested on VHR satellite images with 40-60 cm spatial resolution (QuickBird, WorldView-1 and GeoEye-1). Detailed GeoEye-1 image with snow avalanches in Făgăraș area. 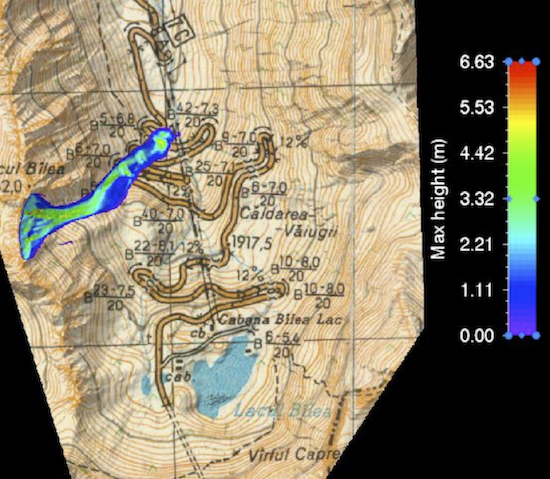 Yellow oulines represent avalanches manually digitized and the red areas represent the avalanches detected by the algorithm. Methodology and stages of development have been established for the change-detection algorithm in avalanche affected areas. 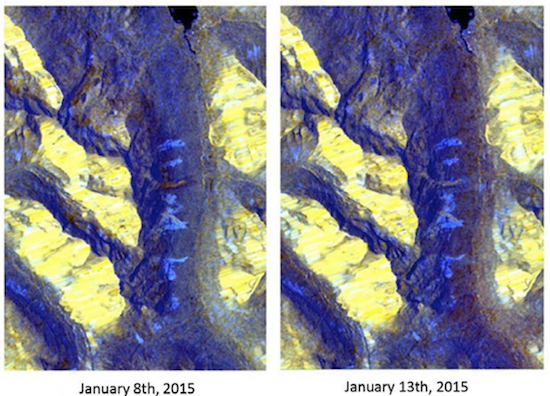 The proposed algorithm is also based on multi-date SAR images. The underlying principle is a pixel-wise comparison of the backscatter intensities of two SAR images, an event image and a reference image, and assumes that both the event image and the reference image are acquired in the same beam mode, pass direction and from the same repeat cycle. The satellite images were selected from archive and corrections have been made. The avalanche detection algorithm was tested on several Sentinel-1 and Radarsat-2 images in mountain areas from Norway. The performance metric of the results indicates that the algorithm does not agree completely with the manual identifications. 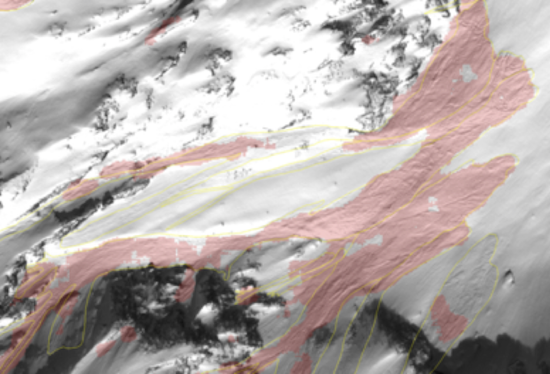 Snow avalanche simulation has been tested and calibrated using RAMMS software. DEMs at various spatial resolutions have been used with different global and snow friction parameter settings. Calculation and classification of friction parameters is based on DEM derived data (altitudine, slope, curvature), forest cover and global parameters (volume and return period). For the estimation of the return period of avalanches in the test areas, data from dendrochronologic reconstructions from other studies have been used. Trajectories simulation have been tested on several high impact past avalanches identified in statistics. The avalanche trajectories, depth, velocity, pressure and spatial extent of the snow deposits were simulated for the glacier valley of Bâlea. The results were similar with the data found in the events descriptions. This activity will continue and avalanche hazard maps will be generated for the test areas.